Most property’s Fascias and Barge Boards are made from softwood. Softwood is used because it is easy to work with and cheap to obtain. In many cases, unseasoned wood is used. However, in order to be weather proof it needs to be primed and painted and this protective paint layer needs to be regularly renewed. If you are comfortable working at heights, have a sturdy ladder, the time you need, the necessary carpentry skills and enjoy getting your hands dirty you could carry out the work yourself. re-attach the gutters and downpipes. For the average-sized three-bedroom house you can expect to pay at least £500 for your roofline and fascia replacement. Plus, because of Health & Safety Legislation, you may have additional scaffolding costs—anything from £320 to £800. Total outlay: £820 to £1,300 excluding additional materials like timber for fascia replacement or new guttering. Over a 20 year period—with inflation at the current rate—your potential outlay can be up to £5,200 or even more! “Thank you for completing an excellent job for us. We all knew it wouldn’t be straightforward but your hardworking, polite and cheerful fitters James & Justyn overcame all the installation problems as they cropped up. They were not fazed with the discovery of neither numerous wasp nests nor the difficult rear accessibility for the installation of the fascia board, guttering and downpipes at the back of the house due to the kitchen extension and conservatory. Most professionals in our industry sector agree that the maintenance cycle for softwood boards is around four years. In other words, your wooden fascias, soffits and bargeboards need to be properly repainted every four years if they are to remain in good condition. If you miss out a maintenance cycle for any reason, or just delay it for a couple of years, there will be much more work to do the next time – some carpentry, for example, to replace rotten wood, or replacement gutters. If you have bargeboards that have been left unpainted, water tends to build up at the base of the ‘gable ladder’, eventually leading to wood rot. You may find that you actually have to consider fascia replacement if the timber is too far gone. Basically, the longer you leave your maintenance, the more time and cost will be required just to get back to an adequate state of repair. Let’s say you keep on top of your four-year cycle, regularly repainting your softwood to keep it in tip-top condition. Surely that’s cheaper than fascia replacement, or replacing the entire roofline with uPVC? Well, the figures may surprise you. 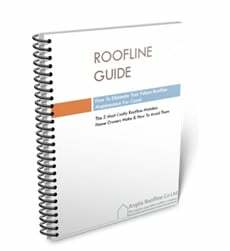 If your roofline was well constructed in the first place, you might be lucky enough to get as much as 40 years’ use out of it. However, a more realistic estimate is probably a lifetime of around 20 years – which is also the projected lifetime of uPVC roofline elements. Increased regulatory and insurance burden: contractors will probably have to comply with more Health and safety legislation in future, increasing the time and labour of every job. When you take all these into account, it’s clear that our estimated increase of 15% over four years is actually pretty conservative! For an average-sized three-bedroom house, the cost to replace the whole roofline with uPVC is likely to be around £2,500. The cost for repairing and repainting an existing softwood roofline on the same property would be around £500. So let’s put those figures into a table and see how the money works out over the whole lifetime of roofline – what it would cost to maintain a softwood roofline as opposed to its uPVC counterpart, taking future price increases into account. Now you can see why replacing your roofline, rather than just re-decorating, is probably a better solution and choosing the right company is important.